Saburo Sakai (August 25, 1916 – September 22, 2000) was a Japanese naval aviator and fighter ace of the Imperial Japanese Navy. Sakai was the Imperial Navy's fourth-ranking ace and Japan's leading fighter pilot to survive the war. On December 8, 1941, Sakai flew one of 45 Zeros from the Tainan Kokutai that attacked Clark Airfield in the Philippines. On December 10, he shot down a B-17 Flying Fortress, the first, flown by USAAF Captain Colin P. Kelly. Sakai’s Tainan Kokutai became known for destroying the most Allied planes in the history of Japanese military aviation. Early in 1942, Sakai was transferred to Tarakan in the Dutch East Indies. Sakai achieved 13 air victories before he was grounded by illness. In April, Petty Officer 1st class Sakai joined a squadron (chutai) of the Tainan Air Group (kokutai) under Lieutenant junior-grade Junichi Sasai at Lae, New Guinea. On August 3, Sakai's air group was relocated from Lae to Rabaul. On August 7, 1942, word arrived that US Marines had landed that morning on Guadalcanal. 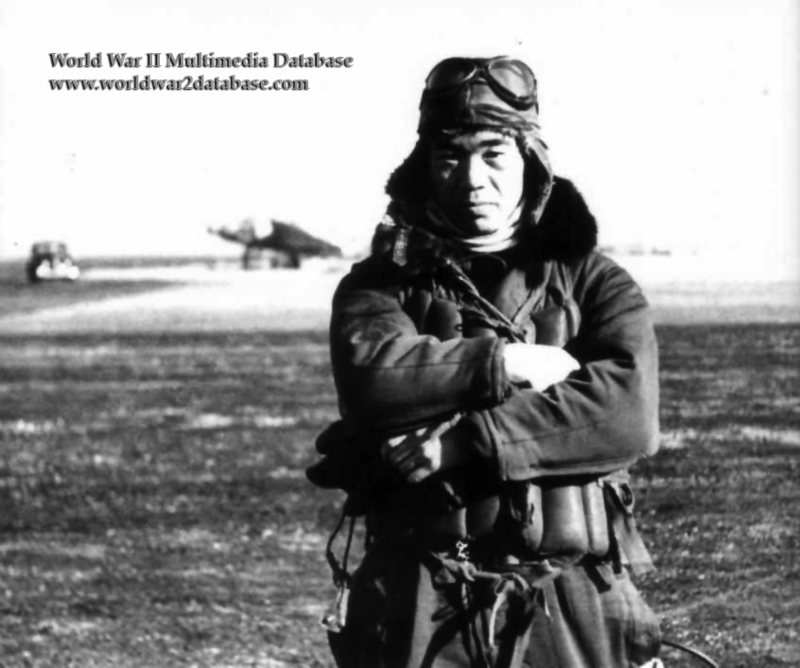 On August 8, 1942, Sakai scored one of the best documented kills against an F4F Wildcat flown by James "Pug" Southerland, who parachuted to safety. Sakai was seriously wounded in combat with Douglas SBD-3 Dauntless dive bombers from USS Enterprise VB-6. Sakai attacked a SBD flown by Ensign Robert C. Shaw near Tulagi. Sakai fired 232 rounds at the SBD, but with its armor, self-sealing fuel tanks and twin machine guns in the rear cockpit, the dive bomber proved a real adversary. A blast from the rear gunner, Harold L. Jones, shattered and blew away the canopy of Sakai's Zero. Sakai sustained grievous injuries from the return fire; he was shot through the head by a .30 caliber round, blinding him in the right eye. Although in agony from his injuries Sakai managed to fly his damaged Zero in a four-hour, 47-minute flight over 560 nautical miles back to his base on Rabaul, using familiar volcanic peaks as guides. After circling four times, and on empty, he put his Zero down on the runway on his second attempt. He had a slow recovery and was detailed to training through 1943. The war necessitated his return to combat. On June 24, 1944, Sakai approached 15 aircraft that he thought were Japanese, but were actually U.S. Navy Grumman F6F Hellcats. Sakai eluded every attack from the 15 F6Fs for over 20 minutes, returning to his airfield untouched, despite only seeing in one eye. Sakai was ordered to lead a kamikaze mission on July 5, 1944, but he failed to find the target in bad weather. All but one of the Jill torpedo bombers in his flight were wiped out. Sakai managed to down a Hellcat, and escaped by flying into a cloud. Rather than follow meaningless orders Sakai led his small formation back to the island, preserving aircraft and pilots. In August 1944, Sakai was promoted to ensign. He made Lieutenant junior grade a year later, just before the war ended. During the war, Sakai destroyed or damaged 60+ Allied planes, mostly American. He was one of three from his original unit who survived the war. After the surrender he became a printer, but the prejudice against veterans was high; his first wife died of starvation. Sakai swore to never kill again and was highly sought after as a speaker. Sakai decried the kamikaze campaign as brutally wasteful of young lives, and shortly before his death, Sakai drew attention for his critical comments about Emperor Hirohito's role in waging war.